Saying your sorry is one of the hardest things you may ever have to deal in life. It is easy to say sorry but it is hard to prove how much you mean it. That is why most people lost their trust because of empty apologies and lack of sincerity. So, if you really want to have a peace of mind, have the courage to admit your mistake and say you’re sorry. I’m sorry for my words and actions last time. I must admit, I am so stupid for saying those words to you. I hope you can still forgive me. From now on, I will think first before saying or doing anything that may hurt others. Having a healthy life is having a forgiving heart. If someone says sorry and mean it, then you should forgive. Do not let your pride blind you from what is good and what is not. I’m sorry for the wrong things that I’ve done. You know I did not mean to hurt you in any way. That’s why I am humbling down myself to ask for your forgiveness. I promise I will never do it again. Being sorry but not being sincere is useless. It will only make you do the same mistakes over and over again. So if you are really sorry, say it like you means it. And remind yourself not to hurt someone’s feeling again. I am not perfect. I may do and say things that may hurt you. But you know there’s no way I will mean it. I hope you’ll never get tired of forgiving me. I am sorry. Find ways to make it up to the one you hurt. Saying sorry is not enough, you have to know how to make things right. Show how regretful you are, and finally, do something to fix what seems to be broken. It will be easy for someone to forgive you if it sees your pure intention and not another lies to cover up what you did. Sincerity comes with a promise that you will never do the same mistake again. Change what needs to be changed and fix what needs to be fixed. Nothing disappoints you more than knowing that the least person you think would not hurt you hurts you the most. Whether he felt sorry or not, no one could change the fact that your trust has been broken. And only time can tell whether you are ready to forgive yet or not. I’m sorry if my presence bothers you. I’m sorry if I gave you too much headaches. If leaving is what gives you peace, then I guess this is goodbye. I hope you feel better now. Do not do something that you will be sorry in the future. Remember, once the damage has been done it cannot be undone. Think ten times before you do anything to prevent others from hurting. I regret the time I told you I do not love you anymore. Everyone knew it’s not true. Can you forgive me? I hope you give me another chance. I’m sorry for being so rude last time. I’m sorry for blaming you when everyone in that room knows that it was my fault. I felt ashamed for what I’ve done. I hope you can still forgive me. Please? People who are sorry for their wrong actions will never make any excuses for what they did. Instead, they will admit their mistake and will humble themselves. Real men say sorry when they made something wrong. Being able to take full responsibility of one’s action is a must-have character. Nothing’s wrong in being apologetic. Everyone should know that. My life would never be the same without you. I am really sorry for what I’ve done. Please tell me how to make it right. I do not want to lose you. I will do everything for your forgiveness. If you’d give me another chance, I promise I will be a better person. The more you found yourself guilty, the more it is hard for you to say sorry. Admitting your sin is one of the hardest yet the noblest thing you would ever do in your life. Better say you’re sorry than being regretful all your life. I feel sorry for those who got offended about my words. I only say what I think is right. If telling an opinion is a sin, then many of us are guilty of that sin. I never meant to hurt anyone. Again, I’m sorry. I apologize to the person I yelled last night. I am out of my mind and wasted that time. I hope you understand that some people are having their bad day. And it is really a bad day for me. I know it is not a valid excuse for my bad action but I do hope that you will forgive me. Sorry..
I’m sorry to disappoint you, mother. I tried my best but I guess it will never be enough. I know I am not as smart as my sister but believe me I am trying hard. I hope this failure will never change anything between us. I’m sorry for not being there when you needed me the most. I’m sorry if it was not me holding your hand. I’m sorry about your loss. I’m sorry I choose to leave than staying by your side. When you know someone made a mistake to you, don’t tell them to say sorry. Wait for them to realize their fault and let them be the first to approach you. I know in any way they will feel the guilt, the one who will never let them sleep well. I felt at ease now after apologizing from my mistake. Nothing feels good than having a peace of mind and a guilt-free heart. Thank you for your forgiveness. No matter how you love a person, there will come a time that you will hurt that person whether you like it or not. Not all things are in our control; sometimes we do not have a choice. Never apologize for the mistakes you didn’t commit. Let the person who commits it suffer from its consequences. Why would you waste your time paying other’s debt while that someone only sitting there without doing anything? That’s what you called stupidity in any ways. I am a big disappointment in my family. No matter how sorry I am, there’s no way they will forgive me. And even if I didn’t hear anything from them, I can always feel their anger. But still, I am hoping and praying for their forgiveness no matter how long it’ll takes. I salute people who sincerely apologize even for the little mistakes they’ve done. It only means that they know how to value trust. May this kind of people always find peace and true happiness in life. How many times should we ask for forgiveness? As long as you feel the needs of asking it. If you haven’t feel at peace, then I think you need to do more. If you are really sorry about what you did, then I’m sure you will be forgiven at the right time. I’m sorry I did not make it on your big day. I want you to know that I did my best and I really tried hard. Just tell me how I can make it up to you and I promise I will do anything you’d ask me to do. Being sorry because you got caught is hard to believe. Would you still feel sorry if no one caught you in the act? I don’t think so. That’s why I keep on reminding everyone to think first before you act. In this case, we can prevent mistakes and hurting other’s feeling. 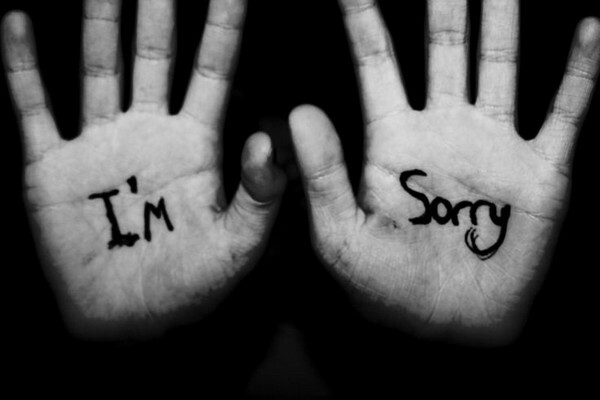 I am a person who easily forgives especially when I hear the magic ‘I am sorry’ word. The fact that you felt sorry means that you are acknowledging your fault and asking for a chance. Who am I not to forgive? Just like them, I am not perfect. If the only way to reconcile to you is for me to kneel down, then I will humbly kneel to you. Words would never be enough to show how much I regret hurting you. I hope you would give me another chance. You know it wasn’t my intention to hurt you. If only I have another choice, then maybe you are not in pain right now. There are just things that doesn’t end the way we wanted it to be. And the only way to fix it is to move forward and let it go. Once again, I want to apologize for causing you distress. I wish everything will be fine as soon as possible. If only I say sorry before it’s too late, then maybe we are still together now. It is only right that you leave me because that’s what I deserve for letting my pride blinds me. I learned a lot from what happened to us. Hoping I will be a better person after all these things. I’m sorry but I think I need to tell you that it’s not working anymore. Maybe, it’s about time for us to give up. We have tried hard, but still it wasn’t enough. It will never be easy, but I know we can make it. Saying sorry doesn’t guarantee us forgiveness. It depends on the mistakes we’ve done. Sometimes, sorry would never be enough to turn things around. Whether we like it or not, we have to accept consequences. But most of all, we have to know that things will never be the same anymore. No matter how many times you’d say you are sorry, there are just people who would never take that. You cannot blame them for being like that, in fact, we all know how hard it is to forgive and forget. The only thing you can do is to wait or better to disappear in their life. You where the perfect man in my life. Only what can I do is sent message in the bottle that will write I’m sorry, for him, just for him. Those blue eyes of the boy will always hunt me. I’m sorry my love. You were the perfect man in my life. I apologize for all the wrong I have done. I think of her day and night, I would like to say sorry for her love that I have lost. When you find her, you should find the way to keep her. It is to late to say sorry and apologize when she is gone. To the most beautiful girl in the world, I’m sorry baby.